New York, NY: New York University Press, September 2016, xi + 319 pages. Jacob Neusner and I grew up on opposite sides of the tracks. Neusner was, as Aaron Hughes has shown in his very good biography, born into a marginally Reform Jewish family, had no formal Jewish education, no supportive Jewish youth group, and no Zionist orientation. He was an outsider to the community of Jews who are consciously committed to, and actively participant in, their community. I came from the opposite background. My father, Rabbi Aaron Blumenthal, was one of the leaders of the Conservative Movement: a founding member of the Committee on Jewish Law and Standards, author of the responsum permitting women to be called to the Torah, president of the Rabbinical Assembly, and winner of an adult education award at his synagogue. I grew up in a Jewish American observant household, was educated in a Jewish day school, majored in Oriental studies at the University of Pennsylvania, completed my MA and ordination at the Jewish Theological Seminary of America, served four years as a congregational rabbi, and returned to academia to complete a PhD in medieval post-Maimonidean Judaeo-Arabic philosophy. I was a son of the Establishment. He asked me to teach “Modern Judaism.” I drew up a syllabus of Mendelssohn, Cohen, Buber, Rosenzweig, Kaplan, and Heschel. Jack responded, “That is a course in Modern Jewish Thought. Try again.” He was right, so I added in Zionism. Jack: “What about the holocaust and the State of Israel? Aren’t they parts of modern Judaism?” He was right, so I added those in, making the necessary adjustments in assignments. Jack: “What about Horace Kallen? Albert Einstein? And Isaac Deutscher?” I didn’t even know some of those names. Again, he was right, so I changed to title to “The Modernization of Judaism” and redid the whole into a new syllabus. He also asked, “How would you teach ‘Introduction to Judaism’ if you did not teach it chronologically or theologically?” And, “How would you teach ‘Methods in Jewish Studies’ while respecting the disciplinary structure of the academic world?” Over the years, I learned how to think through such questions and create such syllabi. I replied, “Yes, I have some knowledge thereof.” Actually, I knew more than I was willing to admit and I suspect he knew that. Again, Jack was right. We did publish UJM in two volumes in 1978 and 1982. It was then, and still remains, one of the few presentations (maybe the only one) of Jewish mysticism as a typology of mystical understandings, using the categories of history-of-religions, and original texts in translation. Through my relationship with Neusner, the Establishment had met Jacob Neusner. And, for over three years, I learned what it means to be an academic: to take data I knew and to see it anew in the light of history-of-religions categories; and to publish and to teach. Yes, I did have a conflict with Jack: I voted against him in a faculty meeting, thereby creating a program that really shouldn’t have been created. Yes, that did precipitate my leaving Brown. But Jack was right, and I never held it against him that he reacted so strongly. In the years after I left Brown, Neusner’s influence on me continued. I gathered the courage to write Facing the Abusing God: A Theology of Protest which called upon depth psychology, sexual abuse, and deconstructionist thought to deal with the issue of theodicy; The Banality of Good and Evil: Moral Lessons from the Shoah and Jewish Tradition which called upon history, and obedience and altruism studies to deal with why good people do bad things; and Philosophic Mysticism: Studies in Rational Religion which broke down the intellectual barriers between philosophy and mysticism in new ways. The mid-1980s were Jack’s most difficult years, as Hughes points out vividly in chapter 6. Jack was very difficult to deal with and I, as well as others, stopped being in touch with him. That was a mistake, and I regret it now for those were the years during which I was trying to develop a doctoral program in Jewish constructive theology. I was, however, completely lost. Neither I nor my then-colleagues at Emory had a vision of what such a program should include. I regret that I did not consult Jack; he would have known how to think about such a program. As near as I can tell, Aaron Hughes comes from a background closer to Neusner’s than to mine—and therein lies the difference in our constructions of the life and legacy of Jacob Neusner. Hughes’s carefully compiled biography of Jacob Neusner begins with Neusner’s background in Hartford, Connecticut, and follows his ongoing fight to acquire, and be recognized for, his Jewish education and his Jewish identity. Hughes correctly identifies Neusner’s three basic assumptions: (1) One doesn’t have to be a member of the Establishment to be a scholar of Judaism; one just needs to work hard and intelligently. (2) Ethnic studies (perhaps, better: group studies) has as its goal to take young people who consider themselves part of the group and to give them a much more sophisticated and informed view of their tradition. Thus, Catholic studies should enable young Catholics to reach a more sophisticated view of abortion, divorce, the Trinity, etc. Jewish studies should help young Jews move to a more informed view of Jewish identity and thought. Ditto for Women’s studies, African American studies, etc. In this view, nonmembers of the group are learning about the other but they are not the main target of such education. For Neusner, this view of education was a betrayal of the universality of humankind. Rather, each and every one of these studies should be addressing common problems, common issues, and in a common language. Jewish mysticism should face the same questions that Christian or Muslim mysticism face. And so on. (3) It is the obligation of the academic not only to do research but also to teach: in the classroom, especially at the beginner’s level, and in the public arena. Public scholarship is part of the job. Hughes faithfully follows Neusner’s untiring effort to bring across these three points. Hughes follows carefully the development of Neusner’s approach to rabbinic texts. It is Jack who asked the question: “How do we know that, when it says ‘Rabbi Akiva said,’ that he really said it?” And: “Given unsorted data, why should we use Protestant theological categories to analyze rabbinic texts when the primary document of rabbinic Judaism, the Mishna, provides us with the six categories (i.e., the six Orders) that the rabbis themselves used?” And: “How are the various genres of rabbinic literature related to one another? What does the appearance of Rabbi X in more than one genre mean?” Given the sheer volume of Neusner’s writings, Hughes has done a very good job of outlining these issues. He was right. Here were serious and accomplished people giving significant time and energy, plus significant money, to Jewish causes—they were, in fact, the core of the active Jewish community—and Hebrew was irrelevant. Jack fought for these people. Hughes displays this long debate well. Hughes follows, too, Neusner’s essay into general American political life as a conservative thinker. Hughes, I think correctly, divides Neusner’s life into two phases: the “historical and critical” phase of his work on rabbinic texts and the “theological” phase of his work on synthesis and academic interfaith dialogue. I do have two quarrels: one with Jacob Neusner and one with Aaron Hughes. Hughes concludes his biography of Neusner with the following: “I would not be surprised if future generations remember Neusner less as a scholar of rabbinic Judaism and less as the herculean author of over a thousand books, and more as an astute commentator on the affairs and experiences of American Jews” (273). And more forcefully: “I maintain that it is his [Neusner’s] theological work that ought to attain for him the status of a great American Jewish thinker” (276, emphasis added). Hughes even goes so far as to conclude that Neusner belongs in syllabi together with Cohen, Rosenzweig, Buber, Soloveitchik, and Heschel (269; 272). Now, I agree with Hughes that Neusner came from, and spoke for, the large segment of American Jewry that has no structured Jewish identity (266). But I do not agree that that will be Jack’s enduring legacy to Jewish history. All the thinkers listed by Hughes (and many others whom Hughes knows well) return to some conception of the divine as the ground of Jewish existence. There are, indeed, a few genuine atheists who are actively Jewish, but they are not the mainstream of the community of Jews without formal Jewish identity. The latter has an unarticulated relationship to the divine that is an unintegrated, but present, part of its identity. That community gets buried with Psalms and liturgy. Jacob Neusner did not do constructive theology in this sense—not rational, and certainly not nonrational, theology. Neusner did, however, as Hughes has clearly demonstrated, make contributions in the field of the study of rabbinic Judaism that are not to be denied. As I see it, the lasting legacy of Jacob Neusner will be realized in the area of the study of rabbinic Judaism. I may be wrong, but I think that this is how Jacob Neusner would have wanted himself to be remembered. 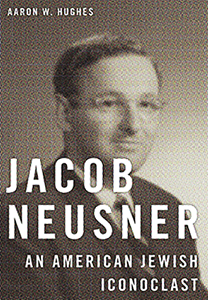 In sum: Hughes’s biography of Jacob Neusner is well done. It is complete. It is also literary: one has the feeling of being present in Neusner’s life. His characterization of Neusner as “a scholar of religion who happened to be Jewish” and, as such, was able to change the study of rabbinic Judaism and, at the same time, comment intensively upon, and argue vigorously with, the American Jewish and academic communities is right on the mark. David R. Blumenthal is the Jay and Leslie Cohen Professor of Judaic Studies at Emory University.